Consolidated Appeals Brought By Uber Overturn Pro-Driver Rulings Of District Court. O'Connor v. Uber, No. 16-5595, and related appeals (9th Cir. 9/25/18) (Clifton, Tallman, Ikuta) reverses the district court's denial of Uber's motions to compel arbitration, based on Mohamed v. Uber Technologies, Inc., 848 F. 3d 1201 (9th Cir. 2016). Mohamed, which we blogged about on September 11, 2016, reversed the district court's orders denying Uber's motion to compel arbitration, and held that the issues of arbitrability and of the arbitrability of PAGA claims had been delegated to the arbitrator in Mohamed, and in a related appeal, Gillette v. Uber Technologies, Gillette's PAGA claims could proceed in court on a representative basis. These Uber Driver cases are ones in which the drivers claim they have been misclassified as contractors rather than employees. In O'Connor v. Uber, the panel has now rejected plaintiffs' additional argument that the arbitration agreements were unenforceable. The panel was not persuaded by plaintiffs' first argument that the lead plaintiff could opt out of arbitration on behalf of the entire class. In a December 21, 2016 follow-up post about the Uber Driver cases, we noted that the Ninth Circuit had amended a footnote in the Mohamed opinion so as to remove a suggestion that a class-action waiver would not violate the NLRA allowance of concerted action, so long as the Uber drivers had an opt-out provision. We suggested that the amendment of the footnote was a material change in light of the then-ongoing issue regarding whether class-action waivers fell afoul of the NLRA policy allowing concerted activity by employees. And as it turned out, the panel in O'Connor v. Uber rejected plaintiff's second argument that the arbitration agreements were unenforceable because they contained class action waivers that violated the NLRA. As the panel explained, the Supreme Court "answered that question and rejected Plaintiffs' argument in Epic Systems Corp. v. Lewis , 138 S.Ct. 1612 (2018)." In addition to reversing the district court's denial of Uber's motions to compel arbitration, the Court explained that the enforceability of the arbitration agreements required reversal of the district court's class certification orders. Additional orders governing communication with the class were reversed, because the class certification orders were reversed. COMMENT: Given SCOTUS's rulings over the past decade on the enforceability of arbitration agreements, it seems most likely that an appeal would lead to the same result. Tribal Sovereign Immunity Was At Issue. Lawsuits filed against Indian tribes trigger issues of tribal sovereign immunity and jurisdiction. Such was the case in Findleton v. Coyote Valley Band of Pomo Indians, A150444 (1/2 9/25/18) (Stewart, Kline, Richman). This is the third appeal concerning contractor Findleton's efforts to enforce arbitration clauses against the Coyote Valley Band of Pomo Indians (Tribe). We previously posted on August 2, 2016, about the first appeal, in which the Court held that the Tribe had waived its sovereign immunity for purposes of arbitrating the contract disputes and that the waiver extended to judicial enforcement of the right to arbitrate and any arbitration award. In the second appeal, the Court reversed the trial court's grant of the Tribe's motion for prevailing party attorney fees because the Tribe was not a prevailing party. Findleton then filed a motion to compel mediation and arbitration and a motion for an award of attorney fees incurred on appeal. The trial court granted the fee motion and the Tribe appealed. By the time the third appeal rolled around, the key issue of a waiver of tribal sovereign immunity had been (mostly) resolved. However, one issue had not yet been resolved: "whether judicial enforcement of arbitration included a potential motion by Findleton for attorney fees." That's a pretty narrow issue, and as the Court explained in Findleton III, it had already held in Findleton I that "the Tribe's waiver of sovereign immunity encompassed judciaial enforcement of Findleton's contractual right to arbitrate." And, critically, "Judicial enforcement of the right to arbitrate includes awarding fees specifically incurred to enforce that right." The Court affirmed the order granting attorney fees and costs incurred by Findleton to enforce his right to arbitrate. 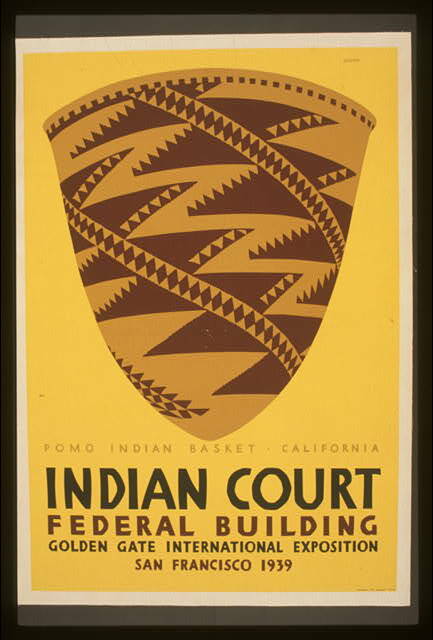 Indian court, Federal Building, Golden Gate International Exposition, San Francisco, 1939 Pomo Indian basket, California. Library of Congress. Court Of Appeal Also Holds That The Federal Arbitration Act (FAA) Does Not Preempt California's Anti-SLAPP Statute. This dispute began in 2012 when Ruiz filed a putative class action against Moss Bros. Auto Group, Inc. (MBAG) for employment- related claims. By the time we get to the instant appeal, Moss Bros. Toy, Inc. v. Ruiz, E067240 (4/2 9/20/18) (Fields, Codrington, Slough), plenty of water had flowed under the bridge. In a Ruiz I appeal, the Court of Appeal upheld the trial court's denial of MBAG's petition to compel arbitration. In a second case, MBAG contended that actually Moss Bros. Toy, Inc. (MBT) was Ruiz's employer, that MBAG was an intended beneficiary of arbitration agreements, and that MBAG should be entitled to compel arbitration; MBT filed an application to intervene. In Ruiz II, the Court of Appeal affirmed the trial court's order denying MBT''s application to intervene in the second case. And this brings us to MBT's current lawsuit against Ruiz. This time MBT alleged that Ruiz had breached a contract by filing his lawsuit rather than arbitrating under the agreement with his employer. The trial court granted Ruiz's anti-SLAPP motion, because MBT's entire first amended complaint was based on Ruiz's protected right to petition, and the Court of Appeal affirmed. The Court of Appeal also rejected MBT's creative argument that the FAA preempted California's anti-SLAPP statute. However, the anti-SLAPP statute does not uniquely burden efforts to arbitrate; it applies to all claims that are based on acts in furtherance of protected rights of petition and free speech. Finally, the Court of Appeal held that the first amended complaint lacked minimal merit, because MBT failed to authenticate either of two written 2010 arbitration agreements in opposing Ruiz's anti-SLAPP motion. COMMENT: There is another issue concerning the merits that the Court of Appeal does not discuss. Does a party to an arbitration agreement who decides to sue rather than to arbitrate breach the arbitration agreement? In Sargon Enterprises, Inc. v. Browne George Ross LLP, 15 Cal.App.5th 749 (2017), the Court of Appeal held that the party to the arbitration agreement , who decides to sue instead of arbitrate cannot be sued for breach of contract, because one has a right to file a lawsuit, and because the defendant can respond by petitioning to arbitrate or by filing an answer. See our post of September 29, 2017 on Sargon Enterprises. Defendant, A United Arab Emirates Bank, Lacked Sufficient Contacts With The US. The court staff summary of this case states: "The panel reversed the district court's judgment compelling arbitration of claims concerning a contract and remanded for dismissal on the ground that the district court lacked personal jurisdiction over the defendant." InfoSpan, Inc., et al. v. Emirates NBD Bank PJSC, No. 16-55090 (9th Cir. 9/7/18) (N.R. Smith, Berzon, Castel). There is waiver and there is waiver. We know that a party may waive the right to arbitrate by vigorously litigating. But the issue in this case was a different kind of waiver. The district court had suggested that, though the Bank fully litigated merits of its personal jurisdiction defense, "it nonetheless waived the issue by vigorously defending the case after the personal jurisdiction issue was decided against it." The 9th Circuit panel disagreed: "A defendant that timely asserts that the district court lacks personal jurisdiction and litigates the issue to an adverse decision from the district court does not waive the personal jurisdiction defense by vigorously litigating defenses to the merits, including by asserting counterclaims against other parties." Practice Tip: The panel distinguished cases in which "waiver arose from the defendant's conduct in failing to properly request a ruling on the issue of personal jurisdiction." In other words, it is not vigorous litigation of remaining claims that leads to waiver, it is failure to preserve the personal jurisdiction issue by requesting a ruling. So if one wants to preserve the personal jurisdiction issue, one should assert the defense, request a ruling, and get a ruling.